Following the success of our Newton Mearns office and the continued demand for our services are required more and more by clients in and around Clarkston, Busby, Carmunnock, Thorntonhall, Muirend and Netherlee areas, we are very proud to announce the opening of our brand new office in Clarkston in the summer. 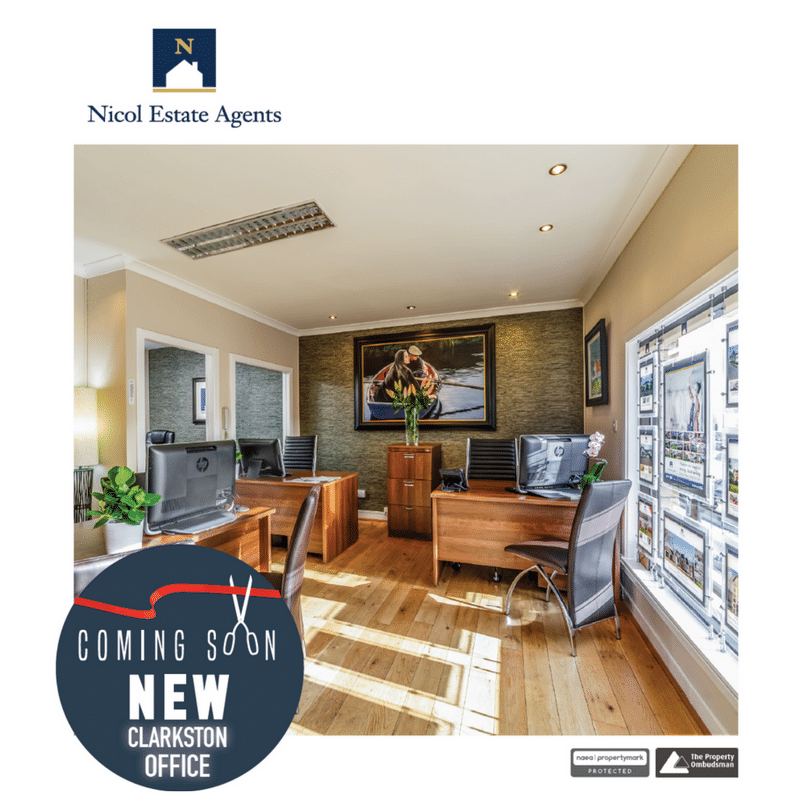 Douglas Nicol, Managing Director at Nicol Estate Agents commented: ” We are delighted to announce the opening of our new office at Clarkston Toll in Clarkston. Our new office will open following a full refurbishment of the premises and will complement our prominent Newton Mearns office. Overall this will help strengthen our presence and market share further in the East Renfrewshire and enable clients to benefit from dual marketing of their homes. Expanding our office presence means we will be better equipped to serve the buoyant local market and we already have an extensive qualified database of buyers active buyers interested to make a purchase in an area renowned for its quality of life, amenities, sense of community and fantastic schools. We require an experienced Sales Negotiator for our new Clarkston office. It’s essential that you are team player with a passion for the property market, organised and sales driven with a professional and flexible approach. As with all customer focused business, there are deadlines and targets and therefore a degree of pressure. Hours of work are Monday to Friday 9.00am to 6pm. Weekend rota. Local knowledge and experience essential. Excellent administrative, communication skills and driving licence required. We are looking for a friendly and confident team player for a Full Time Sales Receptionist vacancy in our new Clarkston office. Experience essential. Excellent administrative, communication skills and driving licence required. We are looking for a friendly and confident team player for a Part Time Sales Receptionist vacancy in our new Clarkston office. Normal working hours are Friday 9am to 5.30pm, Saturday 10am to 1pm and Sunday 11am to 2pm. Please email your CV with a covering letter in confidence to douglas@nicolestateagents.co.uk.